Princess and heir to the throne of Thorvaldor, Nalia's led a privileged life at court. 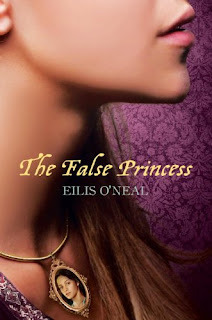 But everything changes when it's revealed, just after her sixteenth birthday, that she is a false princess, a stand-in for the real Nalia, who has been hidden away for her protection. Cast out with little more than the clothes on her back, the girl now called Sinda must leave behind the city of Vivaskari, her best friend, Keirnan, and the only life she's ever known. I will read any book with princess in the title, whether it is a picture book, a fantasy novel or adult non-fiction. The False Princess sounds like it has all of the makings of a perfect novel. Also, the cover is not only pretty but the necklace intrigues me. How does it tie into the story? I must get my hands on this book to find out! Ohhh! This book is now on my wishlist :D Thanks for sharing! Wow...that sounds like some story. Be curious to see how it all turns out. Thanks for the share! I think I have this, I haven't cataloged what has come in this past month.